A little-known New York hedge fund run by a former Yale University math whiz has been buying tens of billions of dollars of U.S. Treasury debt at recent auctions, drawing attention from the Treasury Department and Wall Street. Element Capital Management LLC, led by trader Jeffrey Talpins, has been the largest purchaser in dozens of government-bond auctions over the past 10 months, people familiar with the matter said. The buying is part of an apparent effort by the fund to use borrowed money to exploit small inefficiencies in the world’s most liquid securities market, a strategy that is delivering sizable profits, said people close to the matter. Mr. Talpins is an intense and reserved trader formerly at Citigroup Inc. and Goldman Sachs Group Inc. He is known for a tenacious style that can grate on rivals and once tested the patience of former Federal Reserve Chairman Ben Bernanke. Element has been the largest bidder in many of the 62 Treasury note and bond auctions between last November and July, these people said. 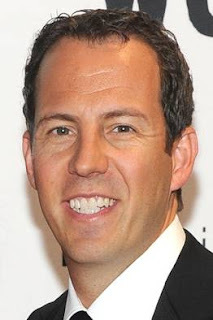 At many recent auctions, some of which involved sales of more than $30 billion of debt, Element purchased about 10% of the issue, these people said. That is an unusually large figure, analysts said. Element’s activity has raised questions because the cumulative purchases far exceed the hedge fund’s $6 billion in assets under management. Treasury officials, who frequently meet with large auction participants, have asked Element about its activity, said someone close to the matter. “Their buying is eyebrow-raising,” said a trader who once worked for a firm that deals in government securities and witnessed Element’s bidding (click on image below). These primary dealers often know the identity of other auction bidders. Element “never shared its strategy, but we often asked,” the trader said. Treasury likes to know who is buying its bonds and why, partly because it prefers long-term holders such as pension funds, insurance companies and central banks. 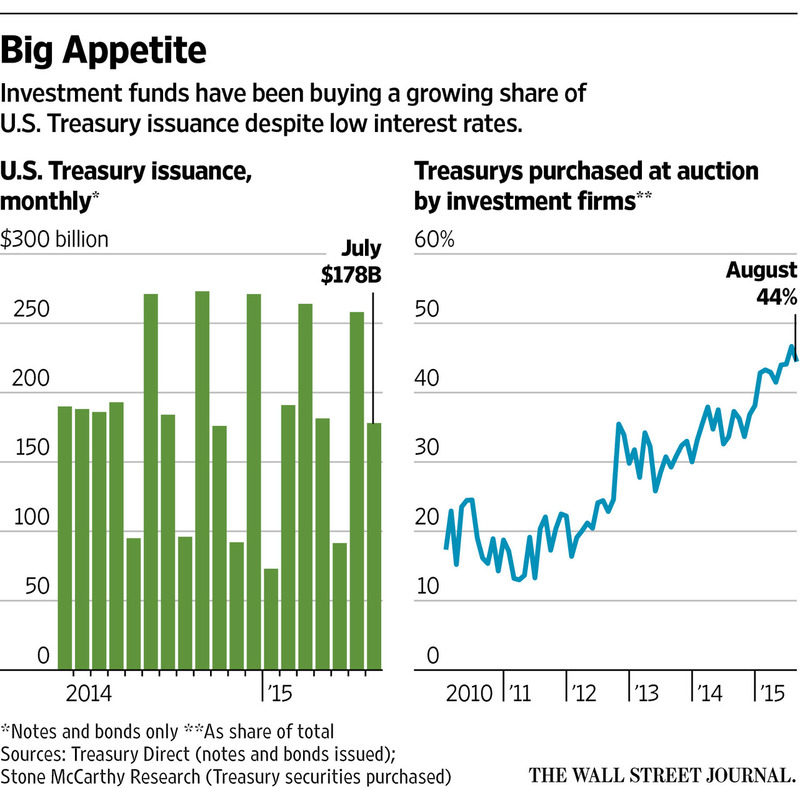 Treasury officials fear purchases by trading-oriented funds could result in sales that increase market swings and potentially drive up borrowing costs. “If you’re issuing debt, your preference is those ‘sticky investors,’” said Scott Skyrm, a managing director at Wedbush Securities. “Consistent with our policy, Treasury does not comment on individual investors in Treasury auctions or conversations with market participants,” a Treasury representative said. Element is a “macro” fund, or one that wagers on global macroeconomic trends in bond, stock and currency markets. The firm uses a “unique probabilistic approach,” according to a presentation the firm made last year at the University of Pennsylvania’s Wharton School. Element had been shorting, or betting against, bonds in anticipation of higher interest rates but has been exiting from that wager, according to someone close to the matter. 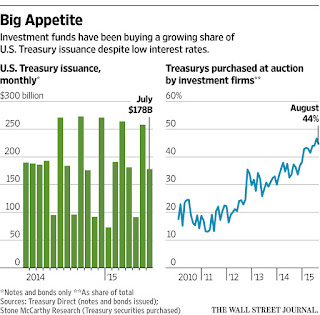 That is one reason the fund has been a big buyer of Treasurys lately. But people who have worked with the firm or are close to Mr. Talpins said there is another reason: Element is among the last to embrace “bond-auction strategies,” trading maneuvers that have become less popular since the financial crisis. These trades aim to take advantage of the effects of supply and demand in the $12.8 trillion Treasury market. Demand for these bonds often fluctuates based on factors including investor perceptions of economic growth and market risk, while supply can be affected by regular auctions of different-maturity Treasury securities. A burst of new supply tends to slightly depress prices for short periods, sometimes for less than an hour. 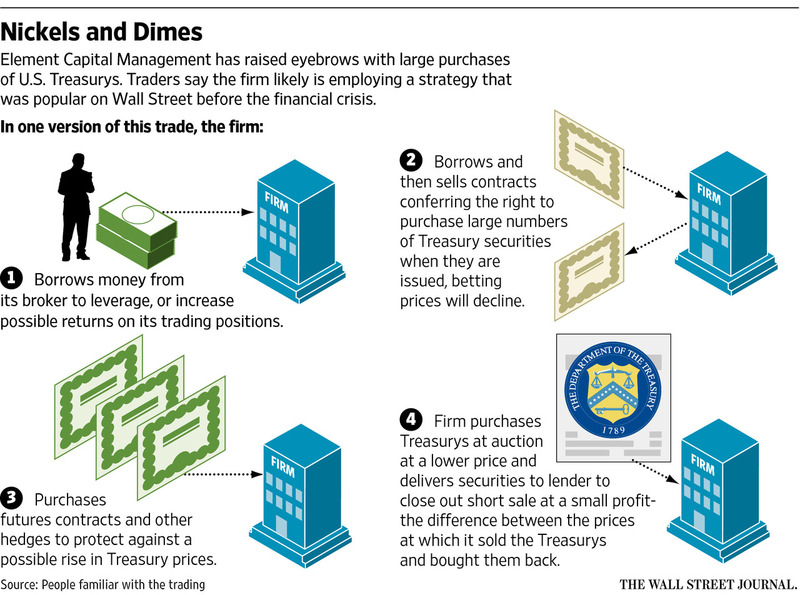 In the past, Wall Street dealers and hedge funds scored profits shorting “when-issued” bonds. These are contracts conferring the right to purchase Treasury securities when they are sold days later at auction. Then, these traders would buy bonds during Treasury auctions at the slightly lower prices and use these newly purchased bonds to close out their short sales. The difference between the higher price at which they sold the Treasurys and the lower price they paid at auction was their profit. There are a number of variations to this strategy, traders said. The maneuver involves a bet against bonds, so traders usually purchased hedges such as Treasury futures or interest-rate swaps to protect against rising bond prices while the trade was under way, said Tom di Galoma, head of fixed-income and rates trading at ED&F Man. After the 2008 financial crisis, bank traders pulled back as regulators discouraged trading risks. Some hedge funds also began shying away from bond-auction strategies. Wall Street banks have significantly cut back their lending to hedge funds. The pullback by rivals has left Element with a large presence in bond auctions to complement strategies such as in foreign-currency derivatives, people close to the matter said. In 2008, the firm gained 35%, these people say, even as financial markets crumbled. The next year, Element was up 79%. Last year it rose just 2.9%. But it was up 18.5% through July of this year, an investor said, beating most hedge funds and overall markets. Some recent gains came from bullish wagers on the U.S. dollar, according to the person. The firm’s annualized average return has exceeded 20% since its launch, investors said. There are dangers with the auction strategy. Once in a while, the prices of bonds being auctioned jump, rather than fall, for reasons such as bad economic news that prompts an investor flight to safety. Hedges sometimes don’t work out. And the strategy relies on inexpensive borrowing because each trade usually yields minimal profits. 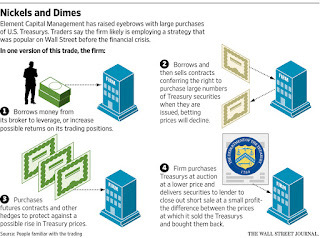 In the 1990s, hedge fund Long Term Capital Management used leverage to profit from small discrepancies in the Treasury market before a market reversal swamped the firm. LTCM used much more leverage than Element does. Mr. Talpins graduated in 1997 from Yale, where he was a research assistant for Robert Shiller, the Yale economist who later won a Nobel prize in economics. In a 1996 letter, Mr. Shiller wrote that in terms of overall performance, he “put Jeffrey first out of the 52 Yale undergraduates” who attended his course Economics 252, Finance, Theory and Application. “I thought he was particularly bright,” recalls Prof. Shiller. Founded in 2005 by Mr. Talpins, Element is closed to new investments. When open it has required a $50 million minimum investment, an unusually large sum in an industry where $1 million is more typical. Friends say Mr. Talpins has been spending more time on philanthropy lately. But sometimes he rubs people the wrong way. A year or so ago, Mr. Talpins was among 20 investors invited by a Wall Street firm to a private meeting with Mr. Bernanke, after his departure from the Fed. Mr. Talpins peppered Mr. Bernanke with about 10 successive questions, according to several people in the room. Mr. Talpins elicited some detailed answers, such as who is in the room during interest-rate discussions. But he also asked questions that exasperated some investors because they seemed irrelevant. Mr. Bernanke looked increasingly weary under Mr. Talpins’s barrage, one participant said. A spokesman for Mr. Bernanke declined to comment. Someone close to Mr. Talpins said he was eager to learn about the Fed’s inner workings because of his focus on interest-rate moves. Element’s purchases appear compliant with rules that limit one buyer to 35% of debt sold in any auction. The limit most famously came into play in the 1991 Salomon Brothers scandal. Element Capital Management, a hedge fund run by Jeffrey Talpins, is yet another example of everything that is wrong on Wall Street today. The issue here is not that Element is doing anything illegal or even shady, but rather just another example of the "anything goes" attitude that pervades U.S. financial markets. Taking advantage of a flawed system is not "good business". It does not create GDP or employment, it merely enriches Talpins and his investors and exacerbates the growing wealth inequality problem. Apparently, Talpins is leveraging his $6 billion hedge fund to buy many times that amount of U.S. treasury notes and bonds at auctions, and then sell them back into the market again for a slight profit, often within just a few hours. So what's the big deal here? Just another hedge fund hot shot who will likely go the way of John Meriwether and his Nobel-prize winning associates after their fund blew up when genius failed. To be honest, I don't really care. Anyone who thinks they're bigger than the bond market deserves to have their head handed to them just like any institutional investor clamoring to invest with the hottest hedge funds deserves to get burned. David Stockman recently wrote a very critical comment on why hedge fund hot shots finally got hammered. I also wrote on hedge funds taking a beating after this summer's rout, unable to cope with huge volatility. And it's the big boys getting clobbered, including well-known behemoths like Bridgewater which is suffering in this environment. No wonder mad money is killing state pensions. The moment a crisis breaks out, hedge-fund investors should pray they’re in a large fund, which has the capital and market influence to survive, right? Just the opposite, it appears. Researchers at City University London found that smaller funds hold up better when the world is going haywire, perhaps because of having fewer “flighty” investors who pull their money out at the first sign of trouble. On Wall Street, bigger is often synonymous with better—bigger bonus, bigger office, bigger job. However, “on average, investors were better off investing with a small hedge fund instead of a large one in times of crisis,” concludes the July-dated working paper from the university’s Center for Asset Management Research. For instance, in 2008, during the global financial crisis, the smallest 10% of funds returned negative 0.48% a month while the largest returned negative 1.28%, for a difference of 0.8 percentage point a month, or 9.6 points for the full year, according to data provided to The Wall Street Journal by the authors. In 2000, amid the bursting of the tech-stock bubble, the smaller funds again performed better, with a monthly return of 1.09% vs. 0.65% for the bigger funds, a difference of 0.44 point a month or 5.2 for the full year. Professors Andrew Clare, Dirk Nitzsche and Nick Motson, all from City University’s Cass Business School, looked at data on almost 7,300 hedge funds drawn from Thomson Reuters’s Lipper Hedge Fund Database from January 1995 to December 2014. The authors offer three possible explanations for the difference in performance. Assessing each will take further research, says Prof. Clare. First, the report says that stakes in larger funds are more likely to be held by those flighty investors, often in a so-called fund of funds—an investment that holds stakes in other funds. “My experience of working in the hedge-fund industry is [that] as soon as the proverbial hits the fan, there is no obvious commitment to the hedge-fund industry by fund-of-funds investors,” says Prof. Clare. Big hedge funds’ performance may have been hampered by those investors cashing out of their fund-of-funds positions, the report suggests. Those redemptions would force fund-of-funds managers to sell stakes in the big hedge funds, whose managers in turn might have been forced into sales of securities at a loss or at a smaller profit than a later sale would have brought. Second, the authors suggest that smaller hedge funds may have had “more stringent gating arrangements,” or limits on withdrawals, that would have stemmed the flow of redemptions. For instance, they may have allowed redemptions only during certain periods each year or had minimum holding periods. “Clearly, small funds tend to be youngish funds,” says Prof. Clare. Such funds may have still had investor covenants in place that restricted cash-outs during the market’s crises, he adds. Third, smaller hedge funds may have been less exposed to market risk than larger ones. By definition, small funds have less capital to invest, and that means they can put fewer investing ideas to work, explains Prof. Clare. “The more ideas you apply, the more exposure to the general market you have,” he says. The biggest 10% of funds that were studied had an average of close to $900 million under management over the analysis period, while those in the smallest 10% averaged $1.2 million. Despite the differences in performance, the average fund size of both large and small funds grew significantly over the period. Assets managed by the biggest 10% of funds nearly quintupled over the two decades, while the assets of the smallest 10% doubled. You can read the working paper the article above mentions here. Smaller hedge funds may indeed perform better in times of crisis but the truth is large institutional investors looking for "scalable alpha" can't be bothered with investing in many small hedge funds which carry their own risks, including career risk. But as I've discussed plenty of times on my blog, a smart hedge fund program will allocate money to large and small hedge funds. Big pension funds and sovereign wealth funds may need large hedge funds for scalable alpha but they shouldn't ignore smaller funds. I would highly recommend they discuss a mandate to invest in smaller hedge funds with top funds-of-funds and negotiate hard on fees and think about which strategies they want to focus on (if you need a help on this, contact me). This is a brutal environment for all funds, not just hedge funds. The Jeffrey Talpins of this world are making off like bandits exploiting "structural inefficiencies" of the bond market and in a world where deflation fears reign, they might be right leveraging up on Treasurys. But there are no guarantees that this strategy will work forever. In fact, I'm worried that as more and more large hedge funds jump on this leveraged bond buying bandwagon (click on chart at the top of this comment), their collective genius/ stupidity will end up costing us all. In other hedge fund news, KKR & Co., the New York private-equity firm, is buying a 24.9% stake in London-based Marshall Wace LLP, marking KKR’s latest move further into hedge funds. I think this is a good move on KKR's part as I used to invest in Marshall Wace and think very highly of their fund and operations. Below, Jeff Kilburg, Founder & CEO, KKM Financial, discusses the WSJ story about a hedge fund manager, Jeffrey Talpins, whose Element Capital, is buying billions of dollars worth of US Treasurys. And Lawrence Delevingne, Reuters, checks out three of the biggest hedge funders' returns for the month of August and where they went wrong, including Dan Loeb and David Einhorn. Lastly, Jim Chanos, Kynikos founder & president, weighs in on China's economic outlook and its currency, stating the "credit event is still to come." He dismisses fears of China selling Treasurys, which Zero Hedge keeps harping on but what I liked what Chanos said about his fellow hedge funds at the end of Squawk Box today: "They forget to hedge and are underperforming on the upside and especially on the downside" (I'm paraphrasing but that's on record). By the way, while we're talking about "obscure" hedge fund managers, there's an "obscure" pension blogger with progressive Multiple Sclerosis who has to trade to make a living and still manages to put out daily comments covering the very latest in pensions and investments. I ask all of you, especially institutional investors, to please subscribe to my blog via PayPal at the top right-hand side of this site (use of one of the three options). As for all of you overpaid, over-glorified and underpeforming hedge fund hot shots, relax, it will be very volatile but markets aren't crashing anytime soon even if the Fed makes a monumental mistake, raises rates next week (I doubt it) and ignores its deflation problem. You should have followed me and loaded up on biotech after the latest selloff. Just make sure you have the barf bags handy, you'll need them!